I have begun to work through the hundreds of pages of details to see what the impacts on all of us will be. So far a few things concern me. As has happened in previous years revenues from property taxes will fall compared to inflation. On top of that revenues from the Land Transfer Tax fell last year and, I believe, will fall again next year. This means we are forced to tighten and reduce the services we provide. Anyone taking public transit (for example) knows why this is a problem. The budget also contains $79 million in “holes” – assumptions of finding new savings and revenues which cannot be counted. This puts the services we depend on at risk. Finally, to keep taxes low, the budget predicts falling further behind on our “state of good repair”. That means things like roads, bridges, and public buildings will not get the investments they should to keep them in good repair, creating risks and future costs. Particularly alarming is a proposal that Toronto Community Housing will see its state of good repair backlog grow by 80% over the next ten years. This is unacceptable. Finally, I will host a budget town hall on February 28. I urge you to find time for this. It will help me learn what is important to you, and helps you better understand the choices we are considering at Council. Payment due dates for the interim tax bills under the three-instalment plan are March 1, April 1 and May 1. Payments can be made through banks or financial institutions, by cheque or in person at the City’s inquiry and payment counters. Locations and hours of operation are available at http://www.toronto.ca/inquirypaymentcounters/. Property owners should pay early to ensure payment reaches the City’s office before the due date. Residents who have recently purchased a property and pay their property taxes through pre-authorized payments or their banking or financial institution are reminded to update their account information with the City or with their financial institution to avoid incurring fees from misdirected payments. Property owners can sign up with Canada Post epost™ to receive a digital property tax bill. Visit http://canadapost.ca/epost for details. Property owners can access their property tax account details by using the online Property Tax Lookup tool available at http://www.toronto.ca/propertytax or by speaking to a customer service representative at 311, available Monday to Friday from 8 a.m. to 6 p.m. Customers outside of city limits can call 416-392-CITY (2489) and TTY users can call 416-392-0719. The pipes in your home can freeze in cold weather. This can leave you with no water or cause your pipes to burst, leading to expensive property damage. 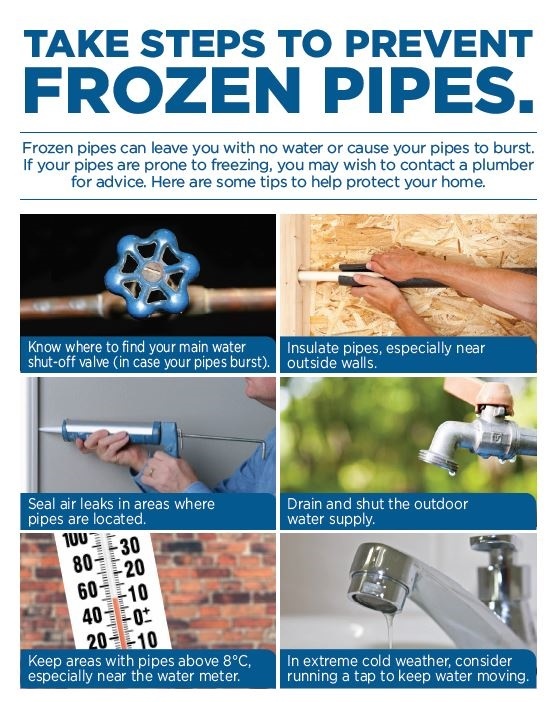 Take steps to protect your pipes from freezing and learn what to do if they freeze at http://www.toronto.ca/frozenpipes . On Wednesday, January 23, 2019, Judith Penfold representing Parkdale Tenants Association and Mercedes Sharpe Zayas and Ana Teresa Portillo from Parkdale People’s Economy’s deputed on the Housing Now Initiative at the Executive Committee. They echo the voices of many in Parkdale and across the City. Watch the videos below to hear their demands. Toronto residents are needed to serve on a range of City boards, committees, and tribunals. Whether you are just starting your board journey or you are an experienced director, there’s an opportunity for you! A process to identify the Round 4 Neighbourhood Grant applications that will be recommended for funding will take place on Wednesday, January 30th 5:30 to 6:30 PM at Parkdale Adult Recreation Centre (PARC) (1499 Queen St. W, 2nd Floor). There are 4 applications that were received and screened eligible for the Parkdale neighbourhood. Of the 4 applications screened eligible the total amount is $5925. A total of $5,000 is available to the neighbourhood. Attached are summaries of the 4 applicants, please review. o Will the target group be interested in the activity/event? o Does the activity/event bring together a diverse group of people from the neighbourhood? o Does the activity/event align with one of the priorities of the TSNS 2020 Theme Area (i.e., healthy lives, social development, economic opportunities, participation in civic decision making, physical surroundings)? o Does the group have a good plan for the activity/event that they will be able to execute? o Is the budget clear? Does it make sense for the activity/event? If members are satisfied with the responses, a decision can be taken by residents (without conflict of interest) as to whether each application should be recommended. A scoring tool will be used to assess each application based on questions above. A decision will be taken among residents (without conflict of interest) based on the results of the scoring tool as to which applications received should be recommended for funding. If you have any suggestions or concerns re: the process that is being proposed, please Contact Rebecca Bassey by January 23rd , 2018 at Rebecca.Bassey@toronto.ca . Applications are now being accepted for the City of Toronto’s 2019 Waste Reduction Community Grants Program. Grants of up to $25,000 are available to support innovative community-based projects that reduce residential waste and/or increase participation in the City’s waste diversion programs. The Waste Reduction Community Grants Program is part of the City’s Long Term Waste Management Strategy, which identifies the need to support grassroots initiatives that reduce waste. The program launched last year and awarded more than $116,000 toward ideas that included the development of signage and programing for tenants of a downtown building, establishment of a sharing library for special event materials for the community, educational training on reducing textile waste and making sustainable fashion choices, and a program aimed at reducing lunch packaging in schools. Initiatives eligible for funding include those that promote waste reduction and reuse, increase waste management education and engagement, and align with the City’s Long Term Waste Management Strategy. Priority will be placed on initiatives that promote waste reduction in apartment buildings and condominiums, and involve multilingual communities, equity-seeking groups and Neighbourhood Improvement Areas. Groups eligible to apply for funding include resident, tenant, neighbourhood and business associations, service clubs, community organizations, registered charitable organizations, environmental organizations and school groups, clubs and councils. March 1 is the deadline to submit an expression of interest. More information about the Waste Reduction Community Grants, the 2018 recipients and the application process is available at http://www.toronto.ca/wastegrants. More information about the Long Term Waste Management Strategy is available at http://www.toronto.ca/wastestrategy. Click here to find out about events happening at library branches in our ward from January to March. Libraries in our ward are Annette Street, High Park, Jane/Dundas, Parkdale, Runnymede and Swansea Memorial. You can also stay up-to-date with the latest library news and upcoming programs by signing up for the What’s On at the Library enewsletter: http://tpl.ca/e-news . Watermain Replacement on Springhurst Avenue from Spencer Avenue to Dufferin Street is expected to start from January 2019. Below is the pre-construction notice as well as an important fact sheet on lead in drinking water.